One of the problems I had with my last build was I don’t see that great without glasses. It makes judging how high you are above the water more difficult and its harder to find your way back to shore. So I bought these prescription Surf glasses. They seem very robust, With the strap tight, I can’t get them off my head. They do not float in fresh water. I have not tried salt water. I will probably add a little piece of yellow tape to the side to make them more visible. I’ve become a fan of Zenni optical - it’s online and dirt cheap. 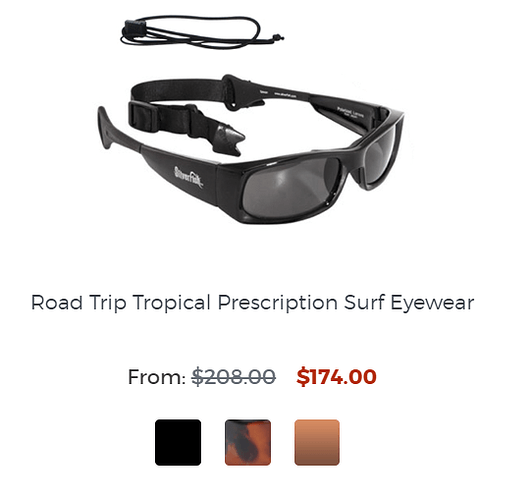 You can get prescription “sport” glasses for $35. I went to that web site. Turns out there are options that would have met my needs. The prices are very good. I told my wife about the site. Shes always buying glass’s. So it still might save me some money. Thanks. 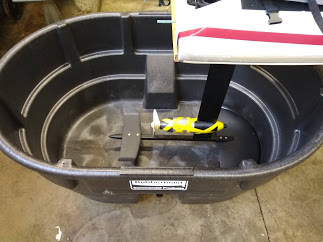 This 150 Gallon Rubber Maid Tank, I got it at tractor supply for I think it was about $70. The shape works out perfect for running the foil. It also will be nice to jump in when summer gets here. Should remove the foil first. I lost my mind. Probably bought 5 pairs of glasses and will likely buy more.